When you imagine inquiring in the universe, your first idea is probably someone looking at something – an image. But there are other ways of sensing and studying the world, too. Last week’s detection of gravitational waves, confirming the presence of what had been predicted by Einstein, is special in that it heralds a new significance to sound in physics. Now, we’re biased as musicians, of course. But that makes it doubly inspiring when you hear the scientists talk this way. “Finally, astronomy grew ears,” says team member Szabolcs Marka in The New York Times. “We never had ears before,” he says. In antiquity, the division between music and cosmos was blurred – sound, mathematics, and philosophy not yet having evolved into today’s specializations. So this notion of a music of the spheres, a resonance between the universe and musical output, was a natural one. But we don’t think quite like the Ancients. So let’s consider what we mean by sound. First, even in this enlightened scientific age, we’re all most of the day limited by our senses. So we think of “light” as what we can see, and “sound” as what we can hear. In the case of the Laser Interferometer Gravitational-Wave Observatory (LIGO), the gravitational wave detectors are really nothing like our ears, let alone a typical sound transducer. They have mirrors and lasers inside, so your first impression might be of something resembling a (really weird) telescope or optical device rather than something to do with sound. There are antenna arms running 4 km (2.5 mi) long, each containing a long vacuum chamber. Suspended mirrors calibrated with lasers are able to register impossibly minute vibrations – on a subatomic scale (smaller than a proton). So why do we describe these as sound at all? Well, we are talking vibrations. 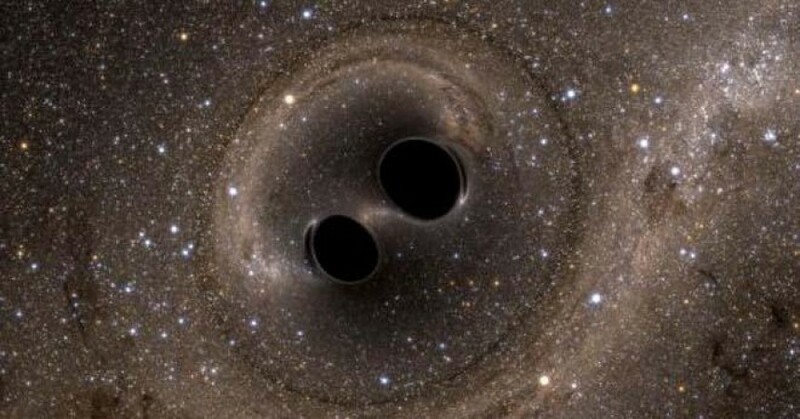 If the LIGO detectors are built to detect the cosmic equivalent of ripples on a pond, we’re talking very big events (the collision of two black holes) very long ago (a billion years) making a tiny but now measurable impact here on Earth. But once we get to that level, the principle actually is the same as what happens in your inner ear. Vibrations in the outside world – even these very low frequency, very brief ones – are what we think of as sound. And detecting variation in those vibrations is how we now a sound has happened (that’s the “if a tree fell in a forest and someone is actually there to hear it” idea). Now, I’m not a physicist. (Seriously – ask my high school physics teacher.) But what we can offer as people in music and sound is a chance to start to talk again with our scientific counterparts. Because from the point LIGO turns its detections into sound, you’ll find yourself in surprisingly familiar territory. There are images associated with major discoveries in space exploration and science, but sometimes, you get sounds, too. It didn’t take long for people to become intrigued by messing around with these sounds. And why not? Pictures of the universe routinely tickle our imaginations and inspire art, so why not sounds of the universe, too? And while we have had sonifications of electro-magnetic signatures of our sky, it’s a new thing to actually be listening to vibrations directly as a principle means of investigation (hence the “growing ears” references). So get ready to listen to the music of the cosmos across billions of years. And what’s next – is there more that can be done with the sonification of this experiment? Remixes? Other ways of listening to the universe? Discuss.